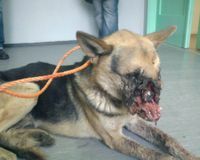 Bosnia and Herzegovina: Justice for Dog Whose Face Was Blown Off By Fireworks by Intoxicated Youths. Justice for Dog Whose Face Was Blown Off By Fireworks! Please Facebook SHARE Vucko’s story. SARAJEVO — Two intoxicated youths duct-taped a firework in a German shepherd’s mouth and blew off his face. But the torture didn’t stop there. The poor dog, known as Vucko, wandered for five days, unable to eat and with maggots infecting the meaty pulp of his ruined face. Vucko was finally picked up by authorities and euthanized after vets were unable to perform reconstructive surgery. of Vucko being examined by vets. Notice the firework’s shell casing still embedded in the dog’s head. We must bring the animal abusers to justice and ensure that this inhumanity is never repeated. Sign this petition to urge Bosnian authorities to hunt down the guilty parties and expose the severity of animal abuse. Don’t let Vucko die in vain!